Rod — thanks for the data update. Does the increase in construction costs since the timestamp on the report data offset the underestimated natural gas prices? I.e., gas operating costs up, nuclear plant construction costs up. I added PBMR to this post — since folks search for this acronym. 2. On March 25, 2008, the commodity prices of steel, concrete, and copper (which constitute 90% of the total commodities costs for a nuclear plant) were $601/t, $98/m3, and $7,634/t respectively. 3. Wind requires 115 MT of steel and 218 m3 of concrete per megawatt, but has higher commodity input per unit of electricity generated due to a lower capacity factor (~25%) compared to nuclear (~90%), S. Pacca and A. Horvath, Environ. Sci. Technol., 36, 3194-3200 (2002). Thanks for taking the time to set us straight on the material inputs. 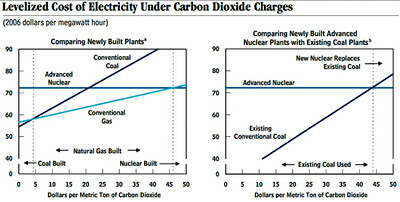 1% means nuclear plant costs are highly insensitive to that component. The CBO study bypassed the contributions to cost increases in their sensitivity analysis — simply assuming -50%, +100%. CERA is tracking similar (210%) increases in the cost of upstream oil & gas projects — the UCCI having a similar 2005 takeoff. Much more depth on energy demand over-running supply can be found in the really excellent CIEP study “Oil turbulence in the next decade – An Essay on High Oil Prices in a Supply-constrained World”, Jan-Hein Jesse and Coby van der Linde, Clingendael International Energy Programme. They conclude that the next decade or so will see high volatility in oil markets – oscillating between marginal cost and user value. I haven’t found a source to build up that figure from first principles — so I can’t confirm the PCCI index. I sat through the one hour CERA web-conference presentation of June 6 — hoping to learn the details. They do have a nuclear index, but didn’t present it. It is part of the distribution package sent to members. >> This price is about $20 to $25 per ton of CO2. (1) but only for the first set of plants — because once deployment gets well underway the capital costs will come down. Probably operating costs as well. (2) the CO2 price will rise to whatever it has to be to make nuclear cheaper than coal — because that is the new equilibrium, as existing coal utilities bid up permits until it becomes cheaper to build replacement nuclear than to keep paying for permits. PS — I just finished a post on “Greens make the case for nuclear power“.